Ok, I admit it, I am not a good golfer. Try as I might I hit the ball left or right and rarely down the middle. On occasion, I do hit a nice shot but that is usually by “accident” but that good shot is what usually brings me back to play more golf and abuse myself even more! I will hit 99 bad shots and one good one and that is the only shot I remember------living in denial is a wonderful thing sometimes! Anyways this post is not only about my game but also about alligators. Ok, you ask what does being a high handicap golfer and alligators have in common? Well as I mentioned in the first paragraph I hit my ball left and right and seldom in the fairway. As such, I am often beating the bushes looking for my ball. Where I live in the mountains of SW Virginia this is not much of an issue when your ball is in the tall grass or in the woods. You push the bushes aside and sometimes you may come across a green snake or something but most of the stuff is harmless. But, playing golf on Bald Head Island can sometimes be an adventure. You see there are alligators that live in the ponds and water hazards along the golf course on BHI. So when you hit that errant shot near the water on BHI you should scout out the area before you go searching for your ball. Sometimes you see an alligator lurking in the shallows while at other times they crawl right up on the course and sun themselves. So, in conclusion, be careful and if you are a high handicap golfer beware there are are alligators around and use cheap balls! OK daddy, did you see that? Growing up in Rhode Island we spent a lot of time at the beach and never paid much attention to what was in the water with us. At every opportunity we were off to the ocean to play in the surf. As a child I did not think much about the creatures that shared the water with us until the movie Jaws was released. For months afterwards I looked at the ocean in a different light and with a new found respect for the creatures that swam along the beaches. I vowed that after seeing that movie I would never swim at night in the ocean. That being said my love of the ocean continues to this day and while middle aged I feel like a kid every time I am in the surf. My daughter Sarah also spending a lot of time at the beach shares the same passion for the ocean that I do. Since she was three, Sarah has had the opportunity to share many weeks at the beach on Bald Head Island. At 14, she considers BHI her second home and has spent most of her life swimming in the warm waters of this small barrier island off the coast of North Carolina. 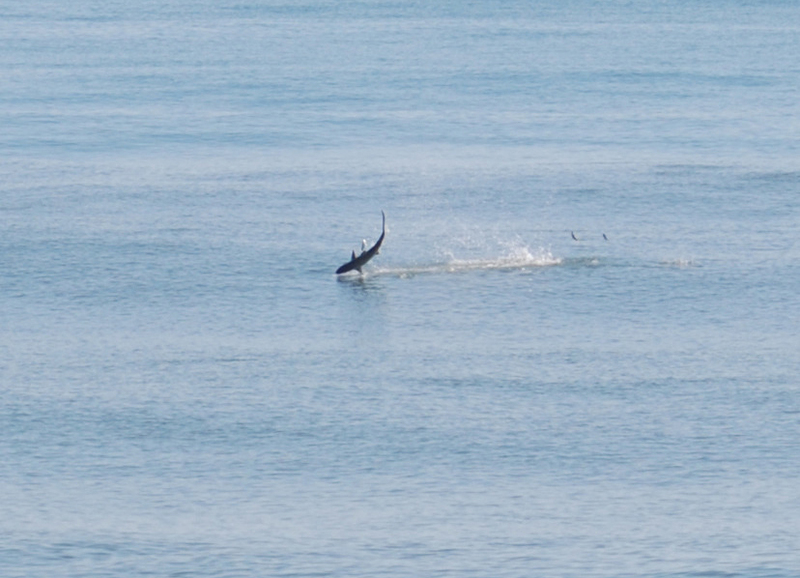 Over the years we have watched fish school along the sand bars just off shore and on a rare occasion we have witnessed a Black Tip or Spinner shark leap out of the water chasing its prey. To us this is one of the reasons that we escape to this island and stand in awe of watching the wildlife make its presence known. Watching a shark chasing its prey in its natural environment is fascinating and we realize that when swimming here we share these waters with these creatures. Ok, so where am I going with this? Well, last summer I was sitting on the beach and Sarah as usual she was in the water with her surfboard. It was a wonderful day and the surf was running better than usual but was breaking close to shore so the rides were short. Having a wonderful time and as always, shouting from the surf line, “daddy watch me” she prepared to catch another wave. Not paying too much attention I noticed quite a few Pelicans diving around her for dinner. I just thought that the the fish were just schooling against the sand bar as they often did. A moment later though a boil of water erupted within feet of Sarah and a long greyish brown body came exploding out of the surf rolling closer to her before diving beneath her board. Startled I ran to the water calling her in as she began paddling furiously for the beach. It seemed that it took forever for her to reach the shore. Eyes as big as dinner plates and gasping for breath she looked at me trembling and asked, “daddy did you see that”? After a few moments and with the adrenalin rush subsiding Sarah looked at me and said that was really cool! Back in the water the following day I noticed that she kept a close eye on the water where she sitting. Yes, she realized that she was not the only thing in the water and came to understand that she is a guest in the water. While Sarah d has a new found respect for the creatures that live there we still jump in the water in care free way. The ocean is a part of us and our soul and we embrace the diversity of all the creatures that live there. I write this not to frighten anyone but to share the beauty that we see on this little island. his is why we stay here, this is why we keep coming back. In my first two posts I wrote about a couple of creatures that inhabit this costal island such as the Tufted Tussock caterpillar and their stinging spines and the hatching of sea turtle nests. My daughter Sarah and I have a deep affection for this island and it is a wonderful place to explore the many different environments and natural habitats. While the island may only be 3 miles long even on a hot summer day you can get lost on the beautiful beaches. We often explore the marshes behind the beach in kayaks as well as stand in awe of all the Live Oak trees with their gnarly limbs and Spanish moss hanging from their branches. A bike ride along Federal Road with its tunnel of trees is a never ending treat. Sarah and I have watched the deer in front of the house wander through the Maritime forest and watched the raccoon that lives in the hollow of a Live Oak across the street lane feed its young. We have meandered along the golf course watching for alligators and have seen fox pups playing in the grass. Sarah has learned to swim and surf in the island waters and to kayak in the creek. Growing up it seems like she has climbed every tree there needed to be climbed on the east end of the island. Our spirits soar when we get on the ferry and approach the island; we take off our watches and slide into Turtle Time as everything slows down. On the east end of the island where we stay, internet and cell service is poor so the gadgets that we are attached to on the mainland are pretty much useless so we go back in time to riding our bicycles and playing on the beach. We have made many friends over the years that share our love for this island and it is always wonderful to renew our friendships each time we visit. 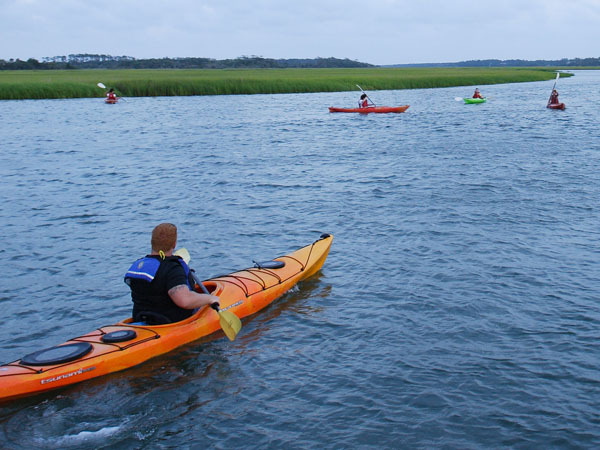 One of our favorite pastimes is to kayak and explore the BHI creek. The creek is at the mouth of the Cape Fear River and fed by the salt water of the Atlantic. 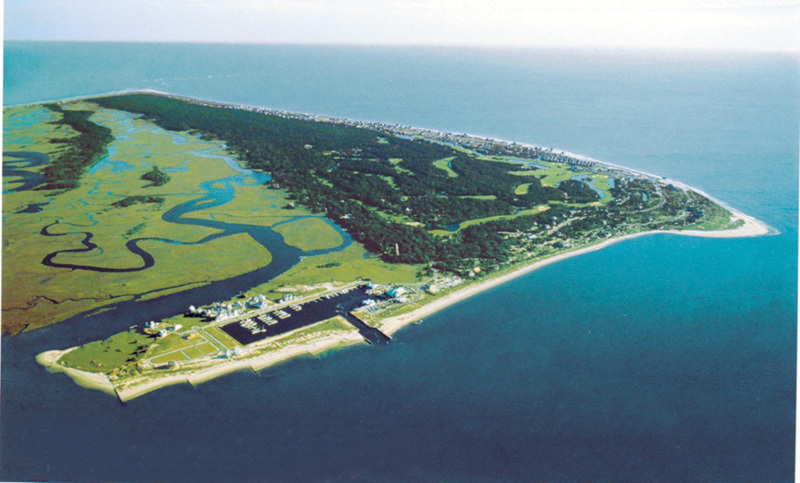 The creek is an estuary and nursery for many different species of wildlife that call it home. Each time we kayak the creek we are filled with a sense of wonder. Often, we sit in our kayaks drifting quietly in order to sneak up on unsuspecting birds. On special mornings a light mist will hang just above the marsh covering us in a soft blanket; it is quiet and still. Drifting along, we sneak up on all sorts of birds fishing for their breakfast. We watch the Herons and Egrets standing in the shallows waiting patiently for a fish to swim by. Periwinkles and crabs scramble along the banks by the thousands. Pelicans fly by in formation and banks of oysters grow out of the creek bed. Fish jump and skim across the surface of the creek. On two occasions we had a special treat in that we saw a family of otters playing along the creek bank and Sarah met up with a couple of dolphins chasing fish up the creek. Now this may all sound delightful but have you ever kayaked with a competitive eight year old? A few years back when Sarah was about eight or nine years old, Santa delivered a kayak to the island for Christmas. On her first trip to the creek in the spring of the next year (the water is too cold in the winter) and typical of her, off she went paddling at top speed eager to explore her new surroundings. I could not get my kayak in the water fast enough before she disappeared around the curve of the channel. Smiling I could hear her splashing and laughing and occasionally see her paddle flashing above the marsh grass. Since this was a new adventure I thought that it would be OK for her not to be quiet. Well fast forward five years and yes, she still paddles like a maniac and goes roaring off frightening all the birds and other wildlife in the area. Competitive as she is, she turns every trip to the creek into a racing adventure always saying in a loud voice "hurry up dad follow me"! Zipping along the channels she will beach her kayak on a sand bar and look for interesting things. Chatting away non-stop I have giving up hope of ever sneaking up on a shore bird again! I have accepted the fact that this young teenager, full of exuberance, loves to kayak the creek for her own reasons. The island is special to each of us in our own way. No folks this is not turtle soup for a group of people but an amazing experience of watching a turtle nest come alive as a mess (that’s a lot!) 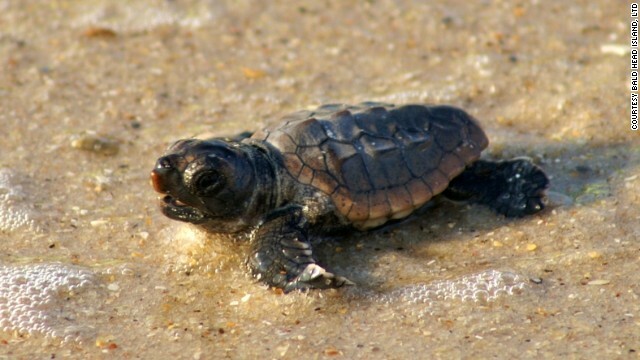 of baby sea turtles begin their journey by climbing their way out of their nest as they head to the ocean. Amazingly, in a boil, the turtles try to escape the nest all at once and it looks like they are boiling out of the beach sand before they scamper towards the ocean. It was a couple of years ago when my daughter and I were walking along the beach near Captain Charlie’s on Bald Head Island when we came across two turtle nests very near one another that were being monitored by nest monitors. From my understanding, a nest monitor is someone that adopts a nest a few days before the expected hatching. I think of a nest monitor as something like a mid-wife assisting the baby turtles by protecting the nest and assisting them during the early minutes of their lives by directing them down the beach to the surf line and their escape to the ocean. The first thing we noticed was an area of smooth sand about five feet wide marked out from the nest to the surf line which was edged in black plastic garden edging; it looked like a runway. Next, the monitors had comfortable beach chairs and other supplies such as flashlights with red lenses as they prepared to spend the evening watching the nest. One nest monitor had a stethoscope that they used to listen to the nest to determine if they heard any turtles digging their way out of the nest. I mentioned a flashlight with a red lens because the baby turtles are very sensitive to light and will head in the direction of a white light instead of going to the water. Apparently sea turtles can’t see the red light. What are the ingredients of watching a hatching? Well, the first thing that comes to mind is patience followed by a beach chair and more patience and perhaps a flashlight and a snack and more patience. As the evening progressed more and more people gathered around the two nests. Both nests were expected to hatch within the next few days. Before long it seemed like there were 15 to 20 people of all ages sitting around chatting about everything and anything. There were people from across the country and Europe vacationing on this small island in North Carolina about to experience a wonderful event. There were children playing on the beach, baby’s sleeping in beach blankets and adults sitting around socialization. Then a sign, a baby turtle stuck its nose out of the sand in one of the nests. Excitement filled the air; everyone waited. A half hour passed and then another hour but nothing happened. Was it a false alarm? Maybe one turtle would escape tonight if the one showing his nose got up enough strength to dig himself out of the sand. People came and went, the Milky Way blazed across the sky and the sound of the surf lulled the children to sleep. What a beautiful night. Finally, the turtle moved and out he came; a little sluggish at first with his battle out of the nest. A little bewildered, the turtle instinctively began moving his little flippers pushing and pulling himself to the water weaving back and forth down the runway as he went. About the size of a half dollar everyone lining the runway was chatting excitedly about this little creature and its desire and focus to reach the surf. It was like watching a ball game and everyone is pulling for the home team. After traveling a few feet there was a sense of excitement as another turtle struggled out of the sand followed by another. In a few moments the nest came alive as little flippers, noses and bodies fought their way from the nest to the runway. Soon there were 20 then 50 little turtles pulling themselves along the runway. Some headed inland but were redirected to the water. The race was on and soon the runway was filled with little turtles. Finally reaching the surf line the turtles washed out and washed back in and tumbling along the surf they finally fought their way through the rough water and out to sea. Emotionally invested in the miracle we just witnessed and with the nest empty and all the turtles in the water we headed back to the house. Saying good-by to the people we met now friends we shared a common denominator with them after witnessing one of nature’s miracles. So, in conclusion the gifts that we received that night were wonderful in that we made new friends and shared in a sense of amazement as we all watched in awe as the little sea turtles made it to the water. Excavating the nest a few days later the interns charged with that found over a hundred turtles eggs had hatched from that nest. The other nest hatched three nights later. Making its way to the ocean. Well, my daughter and I are back from our four day trip to Bald Head Island where we go as often as we can to escape and enjoy the ocean. As usual, the ride to BHI went quickly and as soon as we boarded the ferry the stress of the world melted away and we switched to "turtle time", to those not familiar with turtle time, it is "attitude" that many assume when on the island and everything slows to a turtle pace; no hurrying, throw away the watch! As usual we were excited to get to the house unpack and get some sleep, it was late and we wanted to be on the beach bright and early so my my daughter could surf. Many of the pleasures of visiting the island is of course watching the wildlife. There is always an array of seabirds, foxes, deer, dolphins, alligators, raccoons, lizards and of course sea turtles during certain times of the year. Not paying much attention we left the house for the beach but did comment that there were a lot of caterpillars clinging to the house and trees. We, my daughter and I never saw these types of caterpillars before and were curious and took a close look at them but then hurried away to the beach. Later on in the afternoon hanging out on the front porch, my daughter leaned against the porch railing and then yelped, stuck to her arm was a caterpillar. Flicking the caterpillar away with my finger we continued to chat and then noticed that within five minutes her arm turned red at the site of the caterpillar assault and a rash appeared. We went into the house and applied some ointment to the arm. Unfortunately, the ointment did not work very well and my daughter began to get nauseous and the rash spread. The next day the swelling did not go down and the rash spread further so we took a trip to the Public Safety Facility. When we arrived, we asked if they received any concerns from other people about being stung. The public safety person said no but did mention that they had never noticed so many caterpillars before. So, with a new strategy in mind we headed to the the hardware store where we would ask what the other people on the island were doing about controlling the infestation. As always, we asked the owners if they had repellant for the caterpillars. They said they did but that there were so many caterpillars that it would be a losing effort. I also had a concern that if there were poisoned caterpillars everywhere then the poison might be passed along to the other critters in the environment. We also found out that the caterpillars would turn into moths within ten days and the problem would resolves itself. I know, a long story! Anyways, curious as we are we started to search the web to see what kind of caterpillar they were. Frankly, I never heard of a stinging caterpillar. After much search we could not find anything that resembled our caterpillars. The caterpillars in a line up all looked similar and we could not find the culprit. Further investigation found that no one knew what kind of caterpillar they were. Fast forward two weeks and visiting one of the web sites to BHI there was a picture of the nasty critter. Now we know and to find out you will have to visit my next blog to find out what they are ! I will post pictures as well. This initial blog and future blogs will be dedicated to our interaction with the wildlife on BHI from the alligators to the tiny caterpillars and turtles and all the wildlife in between. If you have a story about about the wildlife on BHI that you would enjoy sharing we look forward to your posts. Hello, my name is Michael. While I live in the Blue Ridge Mountains of Southwest Virginia my soul belongs to an island off the coast of North Carolina called Bald Head Island. My stories are based on the adventures of my daughter and I on our interaction with the island wildlife and the impact that has had on our life. I hope you enjoy our adventures.